This is one of the most successful “subtle” casseroles we’ve made, having a distinctive and pleasant taste without being overbearing. As usual with casserole, it tastes better than it looks. The flavours in this dish all come from the cidery, creamy vegetable stock, which is a delicate taste that could easily be ruined by adding a strong-tasting vegetable or spice. We start by frying onion, then adding leek and celery until they all soften. Then add carrot, courgette and new potatoes and continue to fry gently until everything softens (10-15 minutes). Then we add a finely chopped cooking apple, some cider, cream and vegetable stock, and simmer for 45 minutes to an hour, when the vegetables should be tender and have absorbed many of the sauces flavours. Finally add parsley and season. I wouldn’t really know how this could be modified – any spices or even herbs might be too strong – and you have to like the vegetable flavour naturally as it is enhanced rather than masked. All winter veg could potentially work, although most of my favourites are already here. A very tasty dish that we will definitely try again. Who made it: Dan and Anna together. Recipe: “the complete vegetarian cookbook” by Sarah Brown, page 243. 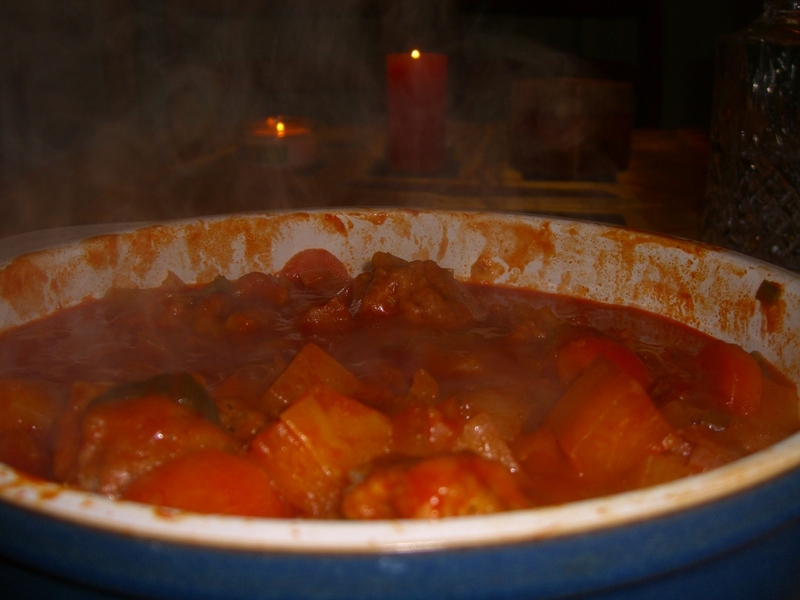 Steaming casserole in the dish. I'm sure the unappealing look of casseroles has something to do with their decline in popularity, because it isn't the taste. Despite the unappetising picture, this simple dish tastes pretty good. Its simple to make, you can leave it to do its thing whilst you eat a starter, and there is plenty of taste and texture for a vegetarian casserole. The key lies in cooking it for a long time in vegetable stock and passata, which become very flavoursome when the water boils down. 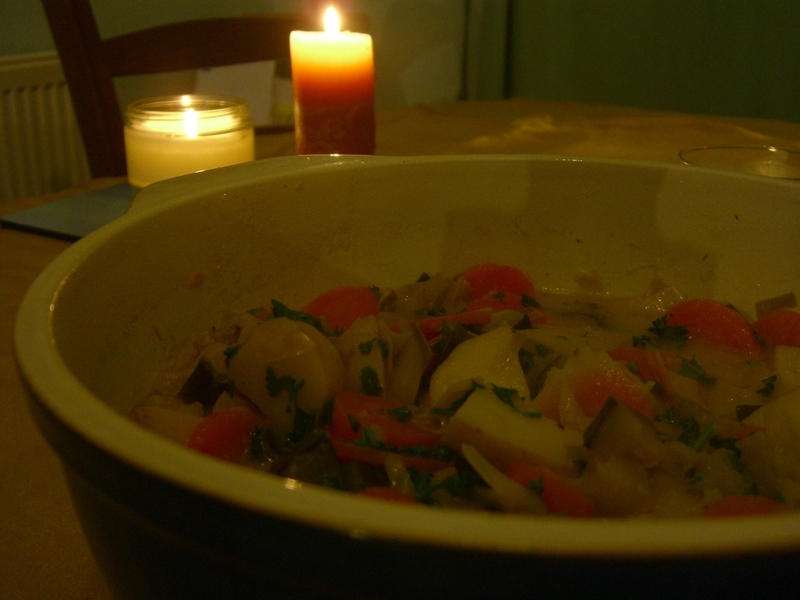 The vegetables are all typical hearty winter staples: swede, parsnip, carrot, celery, leek and onion. The dumplings were a relative disappointment – made with wholemeal flour, added cheese and paprika, I was expecting something rather special. Instead, they tasted basically the same as ordinary dumplings. This is no bad thing, but I had hoped for more. Were I to try it again, I’d go overboard on the cheese and paprika, because I’m sure it it a taste that could really work. The Hungarians long ago discovered that paprika is something like magic in a casserole, so I know it can work wonders. All in all, this was a great choice for a main after a delicate starter. We’ve now got two more portions hiding in the freezer and I’m looking forward to them. Much better than it looks! Recipe: “The Complete Vegetarian Cookbook” by Sarah Brown, page 244.